I’m very tempted to leave it at this. Here’s the beautiful cover photo of an elegant novel. That would be too sentimental, and not at all in keeping with Kent Haruf’s works. Although his stories delved deeply into personal relationships, they were never sentimental. Still, it’s hard not to be sentimental about a book that was written while its author was dying. Haruf’s final novel, like his others, is set in Holt, Colorado. The story centers on two elderly people, Addie Moore and Louis Waters. Both have lost their spouses, and Addie invites Louis to share her bed, to talk to her and sleep with her. Their determination to forge a relationship forms the core of the novel. 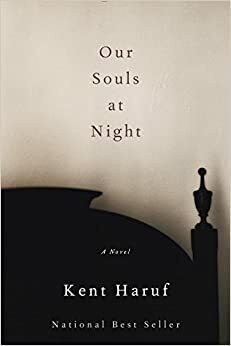 Our Souls at Night, as well as Haruf’s previous books, reminds me of Marilynne Robinson’s Gilead trilogy–spare, elegant, incisive explorations of places and people that make you feel like you’ve found home.